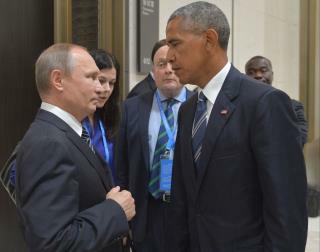 Plutonium: Vladimir Putin suspended a pact with the US in which the two nations agreed to dispose of surplus plutonium that could otherwise go into weapons. The ramifications of this specific pact are limited, explains Reuters, but it carries "powerful symbolism" and could signal trouble ahead for more sweeping nuclear arms agreements. Moscow said the US "has done everything in its power to destroy the atmosphere of trust which could have encouraged cooperation," citing among other things sanctions placed on Russia over its role in Ukraine. The entire Syrian disaster rests DIRECTLY upon DC policies mostly thru Intel working alongside Israeli and Euro intels. Only the American people have restrained our ruling junta and spared that government from the criminal network. So the Syrian people are abused by our leaders of destruction. ooooh, the big stare-down. Who blinks first? I'm skeered.